You may or may not know it, but Text Analysis and Natural Language Processing play a huge part in a modern day digital marketing strategy. In this blog we’re going to dive into just how important they have become in core marketing techniques and skills such as SEO, Content Marketing & Social Listening strategy. We all know how difficult it can be embarking on a keyword strategy. We’ve all been there, you start with your top target keywords and you try and brainstorm new and relevant keywords you think are worth trying to rank for. It’s a bit of a guessing game and can be quite time consuming. There is an easier way, leveraging the concept of semantic relatedness, how close two words are to each other, you can generate a list of words and phrases that are similar and related to your target keyword. However these days it’s not all about keywords. The search engine experience has improved immensely in recent times. Search Engines no longer rely on simple keyword matching and since the introduction of Panda and Penguin by Google they now aim to understand exactly what you are searching for and about. You can read more about that here: What is Semantic Search? With these developments in mind, it’s important for marketers to build more meaningful keyword lists or databases that are rich in context and take the searchers intent into account. So how can Text Analysis help us to optimize our content for Semantic Search? Mining popular content to source target keywords and concepts that are related to your business is an excellent way to start building a semantic rich keyword or even better topic list. Creating quality content that our target market value is more important now than ever before. Good content marketing doesn’t come without its fair share of challenges; knowing your target audience, staying on top of trends, analyzing what works and what doesn’t and positioning yourself as thought leader in your space. Popular blogs or industry focused outlets can be an excellent source for content ideas. Competitors’ blogs can be an even better source of inspiration on what to do, or sometimes what not to do when creating content for a specific audience. Analyzing content can help you gain some useful insights into what your target market want to read about. But it takes a lot of time, right? With this information at hand it’s a lot easier to brainstorm content ideas, track competitors content strategies and uncover mentions of brands and people even that are relevant to you. A neat little feature we offer at AYLIEN is Hashtag Suggestion. We don’t need to go into too much detail here as it does exactly what the title suggests, but it’s worth noting as it is another process that can be semi or fully automated to speed up your content efforts. With the ever-increasing explosion of online content, the need for specific, customized content curation has never been greater. Manually searching through countless social networks and news feeds to find relevant content can be extremely time consuming and is simply not sustainable. As marketers we want this relevant content delivered to us in real-time, as soon as it is published, without having to manually search for it or simply hope it appears on our social feeds. You can learn more about sourcing and analyzing specific news content here to help take your content curation efforts to the next level. Social listening is the process of locating and assessing what is being said about specific brands, people, products and topics on social media. Marketers can build better campaigns and manage their brand’s online presence and reputation if they can better understand the voice of their customers. Gathering information from the places where your customers, target audience and competitors participate in online discussion can be invaluable. However, trying to trawl through all of this content manually just isn’t possible. Text Analytics can make this a lot easier. Advancements in how machines now understand text means we can mine large volumes of user generated content to look for insights at massive scale. The simplest form of social listening is monitoring mentions of keywords. This is pretty straightforward and can be really useful when used properly. P however you can go beyond keywords and get a bit smarter in what you uncover in social data. For example, imagine we’re a retail brand with various branches in a variety of locations. By getting a bit smarter and leveraging the ability to extract entities (People, Organizations, Locations etc…) from social data, we can uncover a lot more about perception of our brand online. Automatically, we can uncover what other brands are mentioned alongside ours, are there particular locations mentioned with our brand and so on, all without having to know what we’re looking for. Sentiment Analysis is a well known and well documented feature of Text Analysis. Analyzing sentiment determines whether a piece of text is written in a positive, negative or neutral way. This can be extremely useful in establishing customer sentiment towards a specific brand or product. Being able to dive into public opinion towards an event or brand to look for trends or insights helps marketers understand the strengths and weaknesses of their campaigns and the voice of their customers. Aspect-based Sentiment Analysis (ABSA) dives a little deeper by analyzing sentiment towards industry-specific aspects, or topics. Let’s use a hotel as an example. There are many areas of a hotel that a customer could either praise or complain about in online reviews – food, drinks, amenities, beds, staff, value, view and so on. Using ABSA we can determine sentiment at scale toward each individual aspect. This helps to give an overall view of hotel performance while pinpointing strengths and weaknesses. The graph below shows the sentiment towards the various aspects of a hotel. We can clearly see that their strongest area is food & drink while their weakest is perceived value among customers. A great way to locate new business opportunities is to monitor specific phrases and words that describe the needs and/or pain points of your target audience. You can monitor for specific words or phrases that include your competitors brand or product name as well as terms like can’t, won’t, hate, worst, etc. You can also monitor for negative mentions of your competitors, again using Sentiment Analysis. Many organizations and larger brands have specific support or help accounts on the likes of Twitter that make mining this data so easy. While we have only really scratched the surface here in terms of how Text Analysis can help marketers, our main goal was to give you an overview of what is possible and to hopefully get those creative juices flowing! 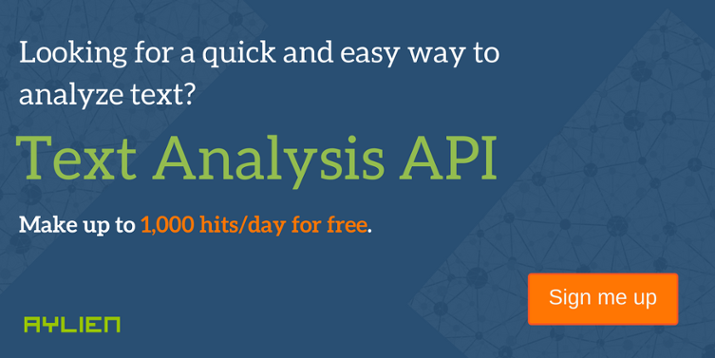 We have thousands of marketers using our Text Analysis API and News API to improve their campaigns, monitor their competitors and boost brand awareness & reputation. They come to us with an idea and we show them how we can help them accomplish it.